When your Cabo cruise sets anchor the thought of only having a few hours to explore this paradise can be daunting. You might wonder how you will get the most out of your time on shore – especially if you don’t want to spend the money or participate in one of the pre-arranged excursions that the cruise ship offers. Here is a do it yourself Cabo cruise guide for the few hours you have to spend in sunny Cabo San Lucas. 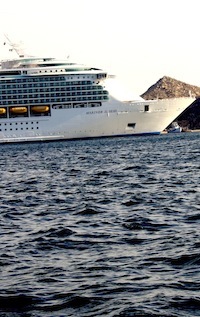 Cabo cruise ships do not actually dock in Cabo San Lucas like at some other ports; they are tendered. This means you will go to a tender platform and board a smaller boat that will bring you to shore. It’s important to make sure you get to the front of the line. If you get in line early, you will have more time for fun in Cabo. When you get off of the boat, you will be at the end of the Cabo Marina. Walk along the pier towards downtown Cabo which is approximately a 10 minute walk. It’s worth the short walk to the Marina Mercado at lot 4. You can enjoy the arts and crafts market where you can find many vendors selling traditional Mexican goodies. Take the time to explore the streets of Cabo and exercise your sea legs. Here you will find souvenirs, fine art, tequila, cigars and much more. If you are missing that mall experience, visit the Puerto Paraiso. This three level mall offers a number of new upscale shops. See a little of downtown Cabo and take a peek at the famous nightlife spots like Cabo Wabo, El Squid Roe and many more. For lunch time, enjoy sitting in one of the many restaurants on the harbor. Baja Cantina has a casual atmosphere and great Mexican food. Senior Sweets, a casual cafe, serves sandwiches and offers specials most of the year. If you would prefer to eat on the beach, there are many options for lunch at Medano Beach, a 20 minute walk from the marina. Here you can eat at one of the palapa bars like the Mango Deck or the Office for a fun and entertaining meal. Or you can choose from one of the hotel restaurants for lunch. Nikki Beach at the ME Hotel offers a upscale dining experience with some of the best sushi in town. Cabo has some really great beaches for all types of vacationers. If you are looking to for the full beach experience, pick up a cab or take the 20 minute walk to the most popular beach in Cabo – Medano Beach. Medano Beach is full of many activities including boating, jet ski rentals, parasailing and of course, swimming. You can swim any time of the year but the water is warmest July thru October. If you are in more of a relaxed mood lay in the sand or rent a beach bed at one of the many beach hotels. If you are looking for a quieter, more romantic spot, rent a glass boat to Lover’s Beach from the marina. The glass bottom boat is about $10 and not only will you be going to the beach – you will be right next Land’s End. At Lover’s Beach you can enjoy some of the best snorkeling in Cabo. There aren’t many vendors or any public facilities at Lover’s Beach so make sure bring everything you need with you. Your Cabo cruise is waiting for you. It is not difficult to catch a cab from Medano beach or one of the hotel, and the 10 to 15 minute cab ride should get you there in plenty of time. Would you do something different with your 5 hours in Cabo’s paradise? Tell us your Cabo cruise story!